I don't know about you but I found that once Bo's teeth started to come through, this added a new and, quite often, frustrating challenge to our daily routine. Brushing them. Bo has quite a strong little personality and generally doesn't like being messed with - just try and brush her hair! - so when we first attempted to put a tooth brush in her mouth, she either clamped her jaw shut like the tightest of vices or stuck her tongue out as far as she could, covering her teeth and making the task impossible. At first, I must admit, I despaired a little and almost resigned myself to a lifetime of fighting to brush her teeth morning and night (a little over dramatic, I know, but that's what it felt like at the time!). However, I soon found a number of different tricks and techniques that I put into practice and which helped me to make the overall experience more enjoyable for both of us. Brush your teeth at the same time and let them copy you. Bo has always found it incredibly funny whenever I brush my teeth so by brushing my own teeth and then brushing hers afterwards, I could make it in to a sort of game. It also seemed to show her what the toothbrush was for, and settled any worries she had about this strange object being put in her mouth. Make sure you brush their teeth gently. When you are trying to do something quickly, there can be a tendency to do it quite roughly too. However, we have to remember that babies and toddlers are often teething and brushing something roughly against their gums could hurt and put them off the idea of brushing their teeth altogether. I found that, if I brushed very gently, Bo was much more receptive to the idea and allowed me access to her teeth without too much of a fight. If your baby or toddler won't let you into their mouth, full stop, you could try the technique of making them laugh. When your baby laughs, their mouth will open giving you full and easy access to those toothy pegs and allowing you to get the toothbrush in there before they realise it. This gives them the opportunity to get used to the idea of brushing their teeth, rather than just rejecting it before the brush is anywhere near their mouth. Let them hold the toothbrush and try themselves. When they get to a certain age, babies and toddlers like to be able to do things more independently. So, to play on their desire to feel independent, let them hold the toothbrush and try to brush their own teeth. When they are very young, it doesn't matter so much if they don't manage to brush their teeth for the full 2 minutes, as long as they are becoming used to the idea of that toothbrush. You could even combine this point with the first point (where they watch you brush your teeth and try to copy). Use alternative methods - such as a finger brush or a wash cloth. Before researching the matter, I had no idea that there were alternatives to a standard tooth brush. The finger brush is basically a flexible toothbrush tip that slips over the end of your finger so that you can use your finger as a toothbrush. This worked wonders for us, as Bo would often put her own or my fingers in her mouth so it seemed a lot more natural to her. I also allowed her to take her time, look at the brush and put it in her own mouth (whilst it was on my finger of course) allowing herself to introduce herself to the idea. If your baby still doesn't take to a finger brush, you could try and use a damp wash cloth. Although perhaps not as effective as a brush, this will still clean away the dirt from their teeth if done on a regular basis. 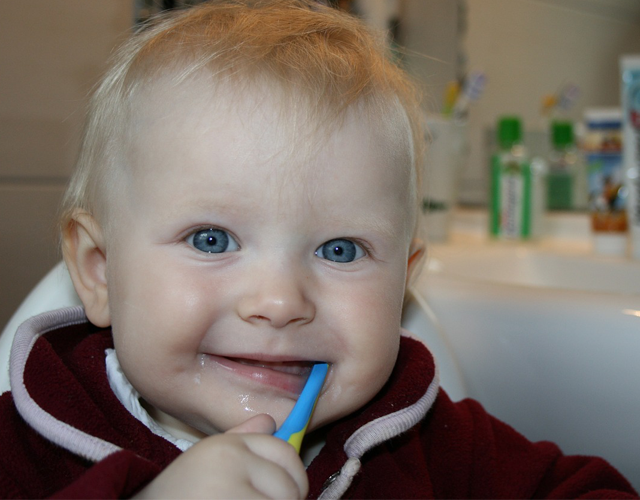 How did you find introducing brushing teeth to your little one? Did you have any problems? If so, what did you do to combat them? - #BloggerClubUK on the Mudpie Fridays blog. - Family Fun on the Diary of an Imperfect Mum blog. Wow, that's really shocking isn't it! And it's such a shame because losing teeth can have such an effect on self confidence. Thanks for your comment! We used the finger brush at first which worked really well - until my little boy decided he hated having his teeth brushed and would clamp down on my finger pretty hard. Once there's a full set of teeth there that's just not feasible! I find the best way is to let him have a go first, then I take over. It still involves a lot of crying, but once he was already pretty upset so I opted to skip the toothbrushing - that resulted in a tantrum because he wanted his teeth brushed! Of course, he still cried while I was doing it! You can't win! Oh dear, you really can't win can you?! We are quite lucky in that Bo has only got her bottom two teeth so far, though the others are on their way! I think once she has her top ones as well we will have to move on to the proper tooth brush as she doesn't really enjoy it either! Thanks for the comment! Ooh good idea with the novelty toothbrush - I might look in to that! Thanks for the comment!